Online registration is closed. If you would like to attend this event contact grit@apppa.org. 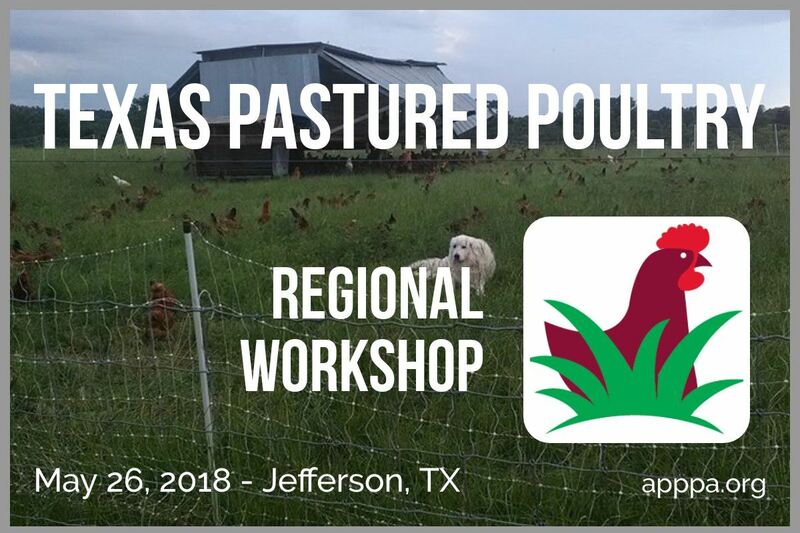 Join the American Pastured Poultry Producers Association at Shady Grove Ranch in Jefferson, Texas. Matt and Jerica Cadman will graciously host producers on their multi-species ranch in East Texas. Farm Tour - Join the Cadmans on a regularly scheduled farm tour and visit all the livestock and corners of the farm. Marketing Discussion - Discuss the how, why and what of hosting organized farm tours for your customers. Open Question and Answer - Bring your pastured poultry questions for a casual but informative conversation about all things pastured poultry. The theme for the day is networking and collaboration. In addition to Matt and Jerica, APPPA board President David Hale will be in attendance to facilitate the discussion. Shady Grove Ranch raises eggs, broilers, and turkeys on pasture in addition to pastured pork and grass-fed beef.